Pâté, Confit, Rillette - Description | W. W. Norton & Company Ltd.
Pâté, Confit, Rillette will delight chefs and home cooks eager for knowledge of charcuterie. 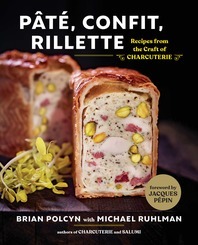 Beginning with the basic principles of how and why these preparations work, Brian Polcyn and Michael Ruhlman include recipes both surprising and delicious, such as a succlent chicken terrine embedded with sauteed mushrooms; moden rillettes of shredded salmon and white fish; classic confits of duck and goose; and a vegetarian layered potato terrine. Part of the charcuterie mandate is using the entire animal and an avoidance of waste so the authors provide the ratios that will allow anyone to create as much or as little of each dish as desired. This is the book for when a cook intends to explore these timeless techniques and create exquisite food.